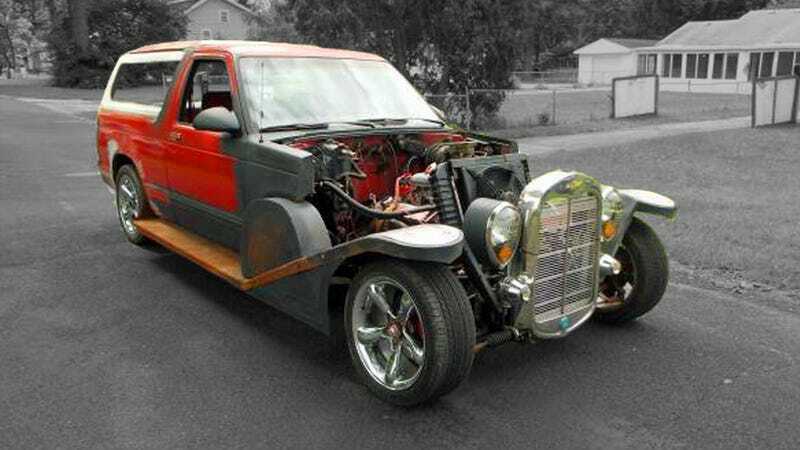 What was once a 1985 Chevrolet S-10 was lured into some lunatic's shop of horrors and has emerged as what I'll approximate as "some kind of post-apocalyptic aristocrat's shooting brake." Plus rust. Wacky! The truckamabob is for sale near Toledo, Ohio right now at the ambitious ask of three thousand American dollars. Apparently that's a "1930's" Ford grille and headlights from a decade later. Engine's a Chevy V8 hooked up to a Ford 9" rear end, all sitting on air-bagged suspension. Interior looks pretty much stock. "Car needs to be finished," warns the ad. Indeed. Images via Craigslist ad. Hat tip to MontegoMan562!